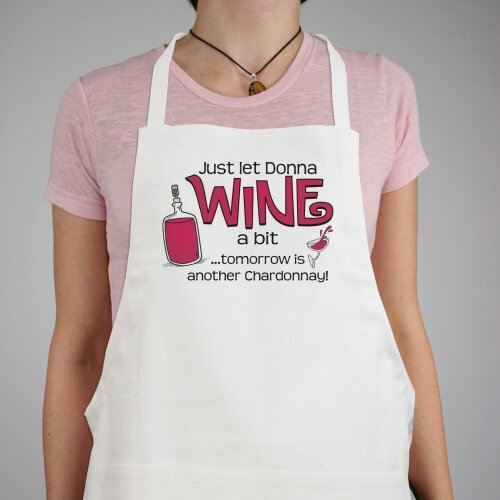 Let the wine flow with family & friends and keep the evening light & fun with your Personalized Wine Apron. 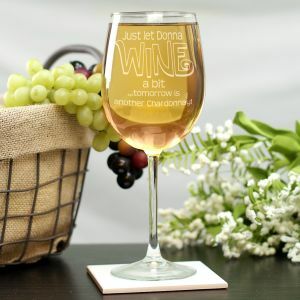 You will look fabulous serving your guests your favorite wine selections. Our Personalized Aprons are full length, 65/35 cotton/polyester twill fabric apron with matching fabric ties. Machine washable. This custom bib apron measures 20" Wide x 30" Tall and features multiple pockets for convenient storage along with an adjustable neck strap for a comfortable fit. Each Personalized Chef Apron comes personalized with any name. 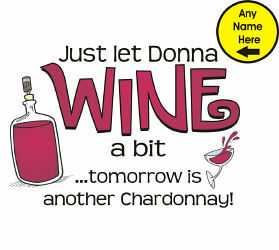 Your personalized gift is always Personalized FREE! The quality was as expected for the price. It was delivered promptly. Take a peak at our entire collection of Personalized Aprons. Our Personalized Aprons are perfect for Christmas, Mother's Day, Father's Day, Sweetest Day, Valentines Day & Birthdays. Create a custom Apron for someone in your family today. Mom, Dad, Sister, Brother, Grandma or Grandpa will love this wonderful apron which you have personalized just for them.